A day in the life of a climate campaigner | It's Up 2 Us! What a day. It started fairly early with some emails and the obligatory review of media, articles and Facebook. Seems there is much happening and to stay aware of. 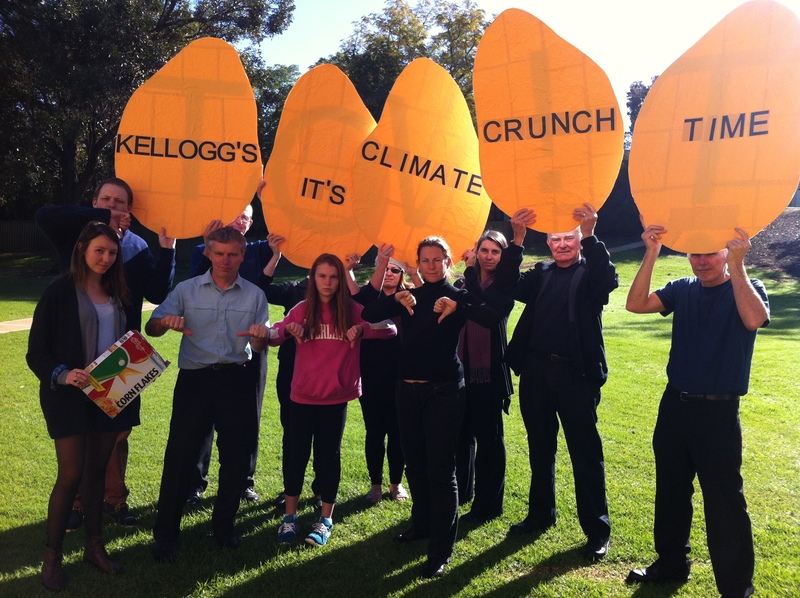 A few of us then met in Bayswater to hold up giant cornflakes. Cornflakes I hear you cry! What the? Well believe it or not agriculture and the food industry account for 25% or greenhouse gas emissions (a lot of this is through deforestation as well as fertilisers and production) and according to the IPCC (who we know are a long way from alarmist) this needs to reduce to zero by 2050 is we are to have any chance of remaining below 2 degrees warming. And the bad news is it’s actually predicted to rise by 30% by 2050 and so far the big end of the food town (who make profits of approx. 1 Billion a day) are not really rising to the challenge. Oxfam have created a report and will deliver this to Kellogg’s on World Environment Day (5th June) and we wanted to get some photos beforehand. I’ll share more about the report and what they are asking for next week, including info of how you can join in with the campaign. We had a ball and it was great to celebrate afterwards with some fair trade chocolate and a cuppa. It’s included conversations about the role of unconventional gas and the analysis required to respond to the massive expansion of this fossil fuel planned for Australia (I’ve been making preparations for a road trip next week that a few of us will be taking to explore the potential fracking sites north of Perth) and, I’ve been supporting the Australian Conservation Foundation in finding a candidate to engage in some political lobbying around the incoming new senate. And now, I’m about to head out to be on the panel for a comedy debate on a Post Climate World: Perth 2050 at the Subiaco Irish Club (I know, not your usual comedic material but if we don’t laugh we’ll probably cry). See here for more info. I’m still in the final stages of preparing to launch our end of year Fundraising Campaign with the goal of $10,000 by the end of June. Your contribution will ensure this work can continue. To donate click here. ← Will We March Australia? Will we do what’s necessary?